Dr. Dawit Kebede Huluka is a certified internist and pulmonologist and critical care medicine specialist. He is an Assistant Professor of Medicine at the Addis Ababa University College of Health Sciences, where he has been acknowledged as an outstanding clinician and teacher. His clinical research focuses on renal and respiratory failure in the intensive care unit. He is also interested in pulmonary diseases in HIV patients. 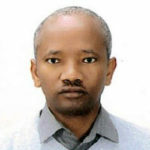 He is the Director of Critical Care Services at Tikur Anbessa Specialized Hospital in Addis Ababa, Ethiopia. Dr. Dawit has worked closely with the Ethiopian Ministry of Health on critical care training manuals and guidelines.